An integral view of illness demands an integral cure, provided our patience allows it. For living in an age of appearances, our view of power and control is equated with the capacity to alter appearances. It has its meaning though. For appearance is the last step through which a web is woven by the pattern and design of phenomenon in such a way that consciousness and energy fully hides behind it. It is like a beautiful gift wrapping that gives a hint of the quality of the present inside. Or it is like the dress that conjures an image and conceals the true reality of the wearer. We get carried away by the dress and appearance. But in reality, an appearance is only a mask. And just as the same psychological type in humanity can hide behind different colours of skin, cutting across nations and races, so too, the same inner disequilibrium can give rise to different clusters of symptomatology. Let’s take a gross example. A stroke and angina may both be the result of a common underlying cause — hypertension. So too, diabetes and hypertension can both relate to a common physiological problem: poor eating habits. Again, poor eating habits, diabetes and hypertension can all perhaps be linked to a common/similar molecular error leading to the genetic regulatory mechanism. In other words, even at the physical level, the same underlying problems can give rise to different and diverse manifestations of illness. The diversity need not be confined to physical pathology but can also extend to the mind. We know, for instance, that rheumatoid arthritis and SLE (degenerative joint diseases) can be associated not only with aortic valve dysfunction (a cardiovascular problem) but also with depression (a psychological problem). The association is rather interesting. When depression comes, then the joint lesions tend to subside in SLE and vice versa. Logic would have it otherwise. But the magic of Nature works differently from the logic of man. Not that Nature does not have a logic. It has a logic of its own. But it has to consider and weave in its scheme of things many more forces and components than man is aware of. That is why we so often fail to understand ‘the mechanism’ and hence fail to understand the magic too. All the while, we are looking at molecular movements and only catch a few. Then we try to erect a whole logical image of things on this basis. What we find is that there are many missing pieces. These we fill up with imaginative and hypothetical mechanisms to erect a complete structure. So often we hear a doctor label a fever ‘viral’ when he is unable to detect any organism. There is a ready explanation too. So often we attribute anginal pain to blocked arteries. But we are unable to genuinely explain why some develop symptoms with a single blockage (or even no blockage), others with two or three vessels, still another after five arteries are blocked. What is even more surprising is that some live to old age and die of some other problem despite the post-mortem revealing a triple vessel block. But the association is fixed more in our minds than in the body. For in the body, many more factors are at play at any given time, both in causing as well as in curing a disease. So ‘cure’ is a complex issue. The word relief (of symptoms) would be more appropriate here. Relief of symptoms is like cutting off the shoots. The roots of the malady lurk unseen in the secret recesses and throw up their bitter fruit again. The roots, the soil that nurtures them and the climate, all need to be addressed, along with the shoots, for a total cure. But symptom removal is what most remedies do. And in this respect, there can be little doubt about the rapidity of action with which the symptom complex is contained. The effect in a few cases at least, can appear dazzlingly miraculous, creating a sudden turn of events thwarting the immediate threat to life. And that indeed is the real place of modern medicine, in the handling of life-threatening emergencies, provided we use it judiciously. In this sense, they can buy time for us to tackle deeper issues and allow intervention at levels that are more subtle. Homoeopathy and acupuncture are two examples of remedies acting at a deeper level. But precisely for this reason, there may be time taken to change appearances. It is quick and easy to detoxify drinking water by putting two tablets in a glass before drinking. This used to be (and perhaps still is) part of the standard kit of a soldier. But the source of water still remains polluted. Detoxifying at the source necessarily takes longer and may need alternative water arrangements during that period. But once done, it is more complete. Allopathy precisely provides us with that stopgap alternative. But then why are some of us so particular about not combining them? Firstly, I doubt if any homoeopath ever denies the use of immediate emergency treatment by allopathic drugs where it is really necessary. But such emergencies are rather few, perhaps only 10% (or even less) of cases actually seen in a modern general hospital. But what about the other 90%? Here the combination may have its disadvantages. The first practical disadvantage is that the homoeopath and most other alternative systems rely largely on the symptom complex. They treat the patient, and not a laboratory test. So, in the absence of symptoms which are suppressed by strong allopathic drugs, the doctor becomes like a blind man struggling to feel his way through, rather than being able to see. An ideal remedy should collaborate with Nature. That is to say, it must either boost Nature’s line of defence (immuno-stimulants, for example) or else supplant it (as do antibiotics). But strong and violent remedies (including early use of heavy antibiotics) simply suppress the information of disease from reaching the physical consciousness. In fact, it may even confuse it. That makes it difficult for a homoeopath to prescribe on. Imagine a frontline battalion, not sending the correct picture of the battle to its rear party. What for us is a disease with symptoms is for the body a valuable pattern of information. The body reads the pattern then corrects the movement by reintegrating it with the whole. So long as the aberrant movement is not reintegrated, it throws itself up again in another form. We can take an analogy from social science (which is also a good example of social pathology). The most primitive and crudest method (though not without its temporary use) that society has devised for dealing with its deviant and aberrant members, is to punish or make them outcast. With the passage of time, more and more of these elements arise till our prisons are full and the outskirts of our social limits are flooded over. It is then that we think of social reforms. We start studying the real source of the malady and we discover often enough that the origin of deviancy did not lie in the deviant group but in the ‘apparently normal group’. The deviancy was merely a cry for change. It was a pointer towards an imperfect, often redundant and otiose way of living out routinely mechanical customs. The deviant was indeed opening the way to a greater land, and could become a source of enrichment, for concealed behind the ‘deviant behaviour’ was the cry of a ‘deep need’ which society had long forgotten in its hankering for fixed safety. It was a cry for freedom, for adventure, a quest towards expansion. The route taken was indeed dangerous but the need was genuine. A true social remedy would be to reintegrate these deviant elements in a way that they too can find their place and, as a result, both undergo the necessary evolutionary change. For it is true that in Nature’s deep (and sometimes harsh) economy, death and disease also have a role in evolution. When their evolutionary necessity is over, these will ‘naturally’ drop off from us. Collaborating with Nature is to acknowledge this deep intent of Nature first, and next study the lines of processes it uses towards fulfilment of this purpose. And since there are not one or two, but many lines of action of Nature, so we too have many systems of therapy. Each system chooses to observe one line, work upon it, study it in the manner appropriate to that level, discover the principles behind it and formulate it into a method of practice. Often these diverse systems try to convey the same thing, but use different languages since each works at a different level. Thus ‘like cures like’ is a principle not only in homoeopathy, but for many allopathic drugs too. Most antibiotics used for treating fever can cause fever themselves; anti-psychotics can cause psychotic symptoms; stimulants can sup-press hyperactivity. Not all drugs however act this way. At a point of time when medicine had not parted from holism by diving into details, there were almost similar descriptions of personality types (seen from a physician’s point of view) and their relation to diseases in Ayurveda, Chinese medicine and allopathy. The pranic healer readjusting the flow of energy through the body often speaks of congestion and depletion. The modern allopath perhaps uses similar language but does not refer to the energy pattern (of which he has no clue) but rather to the physical condition of the organ. There are therefore points of meeting, even as there are important points of divergence. Modern medicine in this case appears more like a divergent member from the rest of the group, which can fairly well complement each other. The main problem of modern medicine is that it has lost sight of the holism from which it was born. It has deviated far and deep into the woods, labelled trees, studied their colours and tasted their fruits, but in the process lost sight of the forest and direction of the path. It is like a child lost in the jungle through an excess of curiosity. The result is that in trying to correct one problem, it creates another. One can envisage a day when, bombarded with chemical bullets (called medicines), mankind as a race loses its natural ability to fight disease. And then… one wouldn’t need a nuclear holocaust, but a tiny mutant virus (which they have also manufactured in the arsenal of weapons) to destroy an entire race, much as plague did in the so-called Dark Ages. Perhaps modern medicine has overstepped its limits, perhaps it is refusing to take counsel from the wiser, older systems. It is so intoxicated with its immediate gains that it erroneously believes that it has changed the destiny of man and saved him from extinction by disease. It forgets too soon that man, the virus, bacillus, cholesterol, and sugar, and everything else has lived, survived and evolved for millions of years without modern medicine. And before man, countless forms of life have thrived upon this planet and more species face the risk of extinction from man than from Nature. Man threatens his own existence as a race as well, albeit with apparent help. The comfortable cure, the handy pill, all of them make our physical consciousness a little more obscure, inert, dull and less responsive, even though they may alter appearances. Thanks to these wonderful remedies that save our bodies, we are losing faith in our own powers to heal and recover. And it is never a healthy trend to become so dependent on external machinery, whether physical or chemical. The challenge of life is lost, the stress to adapt and thereby evolve through assimilation and harmony is taken away; what is left is a static humanity, secure but perfectly helpless (despite all the powers at its disposal) like the paralysed child who never falls or the comatose patient supported by so many machines that make no mistakes! Modern medicine has indeed overstepped its limits. But what about the alternative systems? Do they really cure us? All that we can say is that just as modern medicine has its place in ‘buying time’ in emergencies, so too these systems also ‘buy time’ and also help to a certain extent, though at a deeper level. Lifestyle changes can put our vital-physical parts into better rhythm. Psychotherapeutic interventions can help us change unhealthy attitudes and thereby clear the soil of those elements on which the roots of malady thrive. But none of these dissolve the seed of falsehood buried deep inside human consciousness, so deep that before it, even the might of Nature is helpless. It is as if there was a second, reverse side of Nature which cancels everything, every effort, negating every ‘cure’. It is this that must be tackled for a radical and permanent cure. There is a constant evolutionary pressure which (to use a silly but significant mathematical expression) can be described as being the sum of the forces of creation plus forces of preservation plus forces of disintegration. In our present constitution, these three forces do not work in perfect harmony. Or to speak more accurately, the human consciousness being divisive in Nature fragments the action of these three-in-one forces into the solitary action of each one. These forces are of course not just individual but act universally and support from behind the action of all other forces and powers of the cosmos. In the parlance of Yoga, they are often called rajas (creative energy), sattva (the energy of balance) and tamas (the energy of destruction) represented by the trinity of the three great gods. The ancient system of Ayurveda (the most holistic science of healing) saw disease as resulting from an imbalance of these three forces. Each food, activity, person and medicine was catalogued as increasing, decreasing or balancing one of these three. The prescription was therefore individualised rather than made into a universal formula. The present tendency therefore to patent ‘cough mixtures’ and ‘health tonics’ in a general way under the name of these individualised systems is therefore not a very correct approach even though it seems to work at times. The individual has a considerable role to play by adjusting his diet, activities, lifestyle and inner life movements to effect the lost balance. The drugs or whatever other external aid there is, are only a secondary aspect, useful (and maybe even crucial) in the initial stages of the illness but as the acute symptoms abate under external pressure, the healer within man has to step forward and take charge of his life. There can be no short-cuts to that, no panaceas of the pill that cures, except perhaps in certain obvious structural defects that resist intervention by inner means. The importance of the individual, his lifestyle, mental outlook and power upon health and disease is a fact well recognised by modern medicine too. But most physicians do not capitalise much on this vantage point, they prescribe (often over-prescribe) rather than proscribe. This tendency to find an easy way out, strengthened by the commercial motives of drug companies, leads us in the end to a no-win situation where the disease brings a loss of our innate strength and vitality (which remains under-stimulated as well as sup-pressed further by both disease and drug alike). So even if individuals get well, mankind as a race slides backwards. We have therefore a role to play in healing ourselves. It is only an application of the general principles in Nature i.e. that the remedy lies where the problem is. It is not found outside or elsewhere! The problem and solution co-exist. If there is a weakness within us, the strength to conquer it always exists inside and in an exact proportion. The weakness is the shadow that stimulates the emergence of the light from within. Disease too is a call for the inner healer to step forward, remove the weeds and thorns in our nature and clear the soil of body and the atmosphere of mind, so that the tree of life can bear the fruit of health and its flowers spread the fragrance of love upon earth. Let us therefore now turn from remedies without to the remedies within. The homoeopathic principle of ‘like cures like’ is only an extension of this truth. It is seen at work in the wonderfully precise ecological balance of Nature where weeds grow with the harvest and so protect it from preying birds. So too, we find that the trees and fruits of each region are meant to nourish and nurture the people living in those areas (palm trees in humid places, for example). In addition, one often finds ‘antidote’ herbs to poisonous plants growing in very close vicinity. The Ayurvedic physician utilises this principle in an interesting way. The herbal extracts (as opposed to the active ingredients), as in the opium plant, ‘digitalis’ and sarpagandha, do not usually exhibit the side-effects known to their active ingredients. It is as if Mother Nature mixes things in just the right proportion so as to balance the adverse effects in herbs needed for diseases. Our modern civilisation has often played the role of thief, stealing the active chemicals (oil, medicine cosmetics, salts, sugar, etc.) while throwing away the rest of the plant. But stealth has its own untoward consequences and the side-effects of this ‘plunderer’s approach’ are only beginning to become apparent. The martial arts use this principle in a negative way by using the energy of the opponent to defeat him. So too in some Tantric traditions, it is held that if one can hold within (without giving way) a negative energy for a sufficient period and apply to it the power of will (tapasya=heat), it can undergo a powerful transmutation to its positive counterpart. The application of this principle to our psychological growth is also profound and interesting. Here is what Sri Aurobindo and the Mother have to say about it. “The nature of your difficulty indicates the nature of the victory you will gain, the victory you will exemplify in Yoga. Thus, if there is persistent selfishness, it points to a realisation of universality as your most prominent achievement in the future. And, when selfishness is there, you have also the power to reverse this very difficulty into its opposite, a victory of utter wideness. Even in ordinary life, we sometimes have the experience of contraries. He who is very timid and has no courage in front of circumstances proves capable of bearing the most! To one who has the aspiration for the Divine, the difficulty which is always before him is the door by which he will attain God in his own individual manner, it is his particular path towards Divine Realisation. There is also the fact that if somebody has a hundred difficulties it means he will have a tremendous realisation, provided, of course, there are in him patience and endurance, and he keeps the aspiring flame of Agni burning against those defects. And remember : The grace of the Divine is generally proportioned to your difficulties. The difficulty therefore is an opportunity like the closed door refusing to open, which is still the gateway to a new world. It is our conditioned blindness (or ignorance) which prevents us from seeing the remedy even when it is extremely simple and staring us in the face. It is like Lewis Carol’s character Alice who stands before the door looking for the doorbell and the keeper of the key, whereas all that was needed was simply to turn the knob and gently push to let herself in. The various remedies are akin to the doorbell trying to attract the attention of the healer within. A more direct and straightforward effort is however expected of a human being, if he can summon the requisite faith and courage. For it is absolutely true that if the seeds of illness are within our subconscient parts, then the fire to burn them away lies concealed in our superconscient nature. If the forces of division, disintegration and disease move within us, then the forces of unity, harmony and health lie dormant in us too. If we are doomed to go through the gates of death, then we are also destined to taste the consciousness of immortality. If fear, doubt and worry create in us the conditions for illness, then within us we have a storehouse of faith, trust and peace that can rejuvenate us and bring back the climate of cure. If we seem to be hopelessly condemned to succumb and fall, then we are also being made ready for the Grace that uplifts us, giving a new birth into a new light and freedom. Let us then turn to that door within us wherein lies the all purifying deity, the healer within. 1. 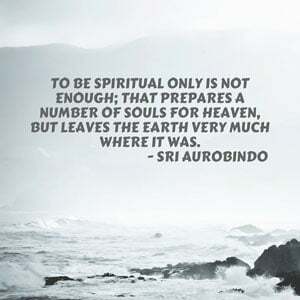 Sri Aurobindo. SABCL, Vol. 24. Pondi-cherry; Sri Aurobindo Ashram Trust. 1970, p. 1660. 2. Op. cit. Collected works of the Mother, Vol. 3. Pondicherry; Sri Aurobindo Ashram Trust. 1977, p. 143.